Last Sunday, when the members of our young church gathered for two services, more than three hundred people attended. Seventy eager believers crowded into our new-members class. A hush spread through the beautiful sanctuary as the congregation waited with expectation to hear the reading of the Scriptures. The pastor had just finished his prayer asking God to illumine the preaching of his Word. Suddenly a cry echoed across the rows of pews: three-year-old Joey Callahan was protesting loudly at the "shushing" of his mother as all three hundred pairs of eyes in the congregation riveted their gaze on the young family. "There is a vast plain to the north where I have sometimes seen, in the morning sun, the smoke of a thousand villages where no missionary has ever been." So said Robert Moffat, a nineteenth-century missionary to South Africa, to his son-in-law, David Livingstone. As we celebrate the first anniversary of our return to Japan, we give thanks to the Lord for a year full of his blessings on this new missionary service to Christ and the Reformed Church in Japan (RCJ). 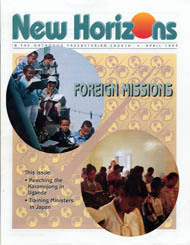 With grateful hearts, we introduce to the readers of New Horizons the ministry of Kobe Reformed Theological Seminary (Kobe RTS), where I have begun teaching biblical studies.